Producing a single score soundtrack can be a lot of work. When it’s a trilogy box set, that’s like cramming three projects into one, and can be a bit overwhelming Thankfully, for The Naked Gun Trilogy, I worked with Neil S. Bulk to make this the best album possible. He spent an ungodly amount of time going through all the various recorded takes for each film, picking the proper version, and noting good alternate options for bonus tracks. We knew that we would have three discs of music, one for each film, featuring Ira Newborn’s scores, and whatever songs we were able to secure licensing for. The first film, The Naked Gun: From the Files of Police Squad, was primarily Ira Newborn’s score, a few source cues, and two songs: “I’m Into Something Good” by Herman’s Hermits, and Frank Drebin’s infamous butchering of “The Star-Spangled Banner”. The Herman’s Hermits song appears twice in the film – once as a montage, and once in the end credits. There are actual differences, as this rendition of the song was recorded specifically for The Naked Gun, and never released. In the end, we stuck with the end credits version, but it still needed to be mixed. This is where I took what I had learned with The Addams Family to the next level, creating a delightful stereo mix from the analog 24-track stems. Suffice it to say, I’m very proud of the end result. We also had a 24-track source of Leslie Nielsen performing “The Star-Spangled Banner”, with multiple takes and versions (none mixed), but none of these were the film version which it seems was done on location with production audio. So we’ve provided this “studio pre-record” version on the soundtrack, using the takes that were closest to the final result. The Naked Gun 2 1/2: The Smell of Fear only had three songs: the instrumental “Tangerine”, the wry piano-vocal “I Guess I’m Just Screwed”, and the very brief “Ding Dong the Witch is Dead”. The last track wasn’t worth licensing (it’s barely 5 seconds long), but “I Guess I’m Just Screwed” was a simple two track: mono vocal and mono piano. I did a bit of work to do a mono-to-stereo conversion, and I don’t think you’d really notice unless someone pointed it out. 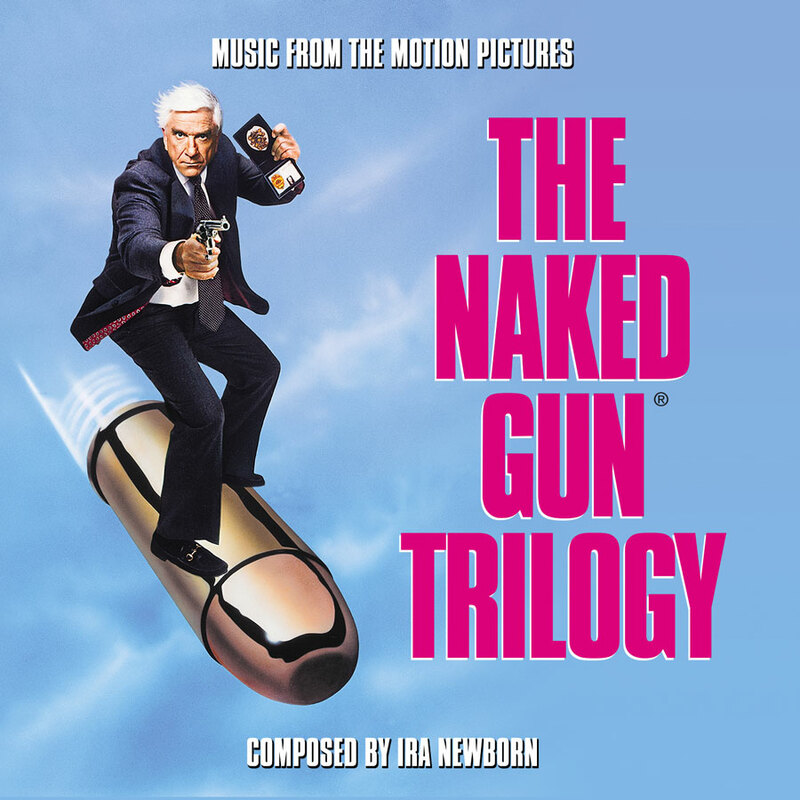 The final film in the trilogy, The Naked Gun 33 1/3: The Final Insult, features a major sequence taking place during the Academy Awards, featuring a big fight for which Ira Newborn wrote a bunch of exciting score cues – which are intermingled with a Pia Zadora performance of Steve Allen’s “This Could Be the Start of Something”. There were also a bunch of “awards show” source cues through the sequence, meaning that if we were to present the music as heard in the film, it would be a bit of a mess. The end result was putting the Academy Award material as a group at the end. One of the funnier bits in the film is when the nominated films are presented, one of which includes “The Food Song” from Mother Theresa: The Musical. Actually director Peter Segal in drag, the vocal track from the song was missing from the music archives – it might have been on the dialogue track – and so we were unable to present the song as heard in the film, but did provide the instrumental backing track. The artwork for the project was fun to do – with so many photos to choose from, the biggest problem was how to grab so many iconic and classic images, and get them all to fit within the constraints of the booklet. The cover was recreated from the original Naked Gun key art elements, using some of the home video assets as well for the text title treatment. One lingering question we were forced to deal with: would we use any photos of OJ Simpson? The answer ultimately was “yes” but very limited and not focusing on him. Because, well, you know. Given the sheer number of tracks, there was no way we would be able to list them on the back of the album tray, so an abridged listing was placed there, with detailed track lists within the booklet. Each film got its own spread, as well as AFM musician lists. I’m very happy with how this one turned out, and you can check out the artwork here.